Our daily updated search engine of photos with themes of Slovakia enlists more than 751 photos in portfolio of this author. We have detected that visitors who were interested in this large preview photography with title: Wooden bell tower in Pribylina, were also further interested in other pictures from author Jareso. Here is a selection of 6 most popular photos available in portfolio of this author. Our daily updated search engine found that this royalty-free stock photo with theme of Slovakia entitled: Wooden bell tower in Pribylina, is available at Dreamstime stock photo agency. We have detected that this stock photo is available in various resolutions, dimensions, licenses and file formats. The highest available dimension of this stock photo is as big as 3196 x 4380 pixels! If this stock photo was printed it would be as 27.1 x 37.1 centimeters (10.7 x 14.6 inches) big at size of 300 dpi. It is available in JPG file format as well as in additional TIFF file format. You can easily purchase and download this stock photo in the source agency. 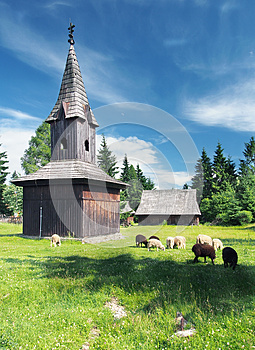 Rare wooden bell tower with sheep nearby during summer. This preserved construction is located in open-air museum of Litov Village, near Pribylina, Liptov region, Slovakia. Other constructions can be seen in background. Litov Village museum shows typical folk architecture and life-style of Slovak rural communities in the previous centuries. Museum is opened for public and it is definitely worth a visit. This stock photo was photographed by Jareso and so far it was downloaded by one person who appreciated great quality of this royalty-free stock photo. Be the another one to have this photo with the theme of Slovakia. Register at Dreamstime stock photo agency and purchase this photo today.